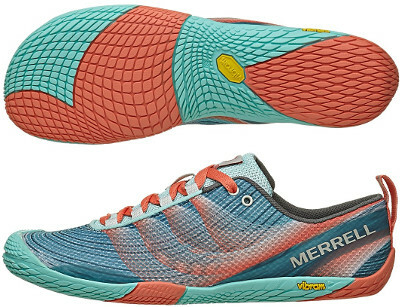 Merrell Vapor Glove 2 are neutral minimalist running shoes. The Vapor Glove 2 is the new version of the radical minimalist shoe from Merrell. It targets runners with great technique developing a natural stride with full ground contact. After discontinuing the Road Glove 3, only the Vapor Glove 2 and the 4 mm cushioned Bare Access 4 remain in the road collection. Major update from its predecessor the 2013 Vapor Glove is the new breathable mesh upper. There is also a couple of thin TPU layers on both sides to support foot flexion and a more traditional lace system for snug fit. Outsole is made of the same well known high performance Vibram™ TC1 rubber, even it keeps the same design. The Vapor Glove 2 is barefoot friendly not only because of seamless soft feel but also because both breathable mesh lining and integrated footbed are treated with M Select™ FRESH to reduce shoe odour for healthier foot environment and better comfort. Like many other Merrell products, only high quality synthetic materials have been used to manufacture the Vapor Glove 2 making them suitable for vegans.